Joan Maloof is a Professor Emerit a of Biology and Environmental Studies at Salisbury University in Salisbury, MD. She is an ecologist, writer, conservationist, and above all a “lover of old growth forests”. These days Maloof spends her time writing, lecturing, visiting and observing forests, and helping private landowners and local groups protect the few remaining old growth forests from development. Her books have won numerous awards for her passionate and eloquent writing. All of them are immensely readable and take us on a series of intriguing adventures deep into the mysteries of old growth forests and “left alone places”. As one reviewer wrote, “Malo of examines forest ecology, often from the perspective of the weevils that inhabit acorns, snails that live in the rich debris below trees, and parasitic wasps that dwell on a species of leafminer found only in American Holly. Clearly to know such details is to care about them.” Grab one of Maloof’s fascinating books and curl up by the fire for a naturalist’s perfect antidote for a cold winter’s day. In 2005, Maloof published her first book, Teaching the Trees, Lessons from the Forest, and shared her love and wonder at the beauty and complexity of these forests through a series of eloquent essays exploring the connections between a tree species and the fauna that depend on it. The book contains illustrations from naturalist - artist John Abbot’s book - The Natural History of Rarer Lepidopterans in Georgia - published over 200 years ago; the illustrations are a treat in themselves. 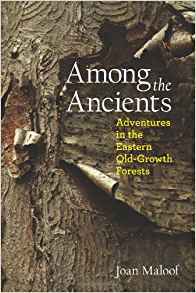 In 2011 Maloof published, Among the Ancients: Adventures in the Eastern Old Growth Forests. With less than ½ of one percent of old growth forests still left in the Eastern United States, Maloof realized that many readers will never see such a forest. She takes the reader on an intimate tour of 26 old growth forests east of the Mississippi River – one in each state, all open to the public. From old growth hemlock forests in Pennsylvania to Oak, Hickory, and Tulip Poplar forests in Ramsay’s Draft Wilderness in the George Washington National Forest in Virginia, she shows us the rich diversity of life that these ancient forests support. And she provides directions, so that the adventurous reader might also experience their wonder. Following in 2016, she published Nature’s Temple: The Complex World of Old - Growth Forests where she explores the intricate web of relationships that make old growth forest ecosystems so uniquely rich and biodiverse. With chapters entitled, “Birds and Their Habitat Preferences” , “Snails as Indicators” , and “Herbaceous Plant Populations and Logging” , she explores recent research comparing species diversity in old age, second growth, and recently cut forests. She argues eloquently that forest snails and salamanders may be the best indicators of a forest’s health, and that while ground or herbaceous layer 11 plants make up only 1% of a forest’s biomass, they account for over 90% of the plant diversity. Maloof points out that, “the diversity of all other organisms in a forest, from butterflies to mammals, is more closely correlated with herbaceous plant div ersity than it is with tree species diversity”, and this diversity does not appear to be recovering, even after several hundred years.